In general, it is the 1992 T-90 tanks that are fighting in Syria, but the 2004 T-90A tanks are also present. 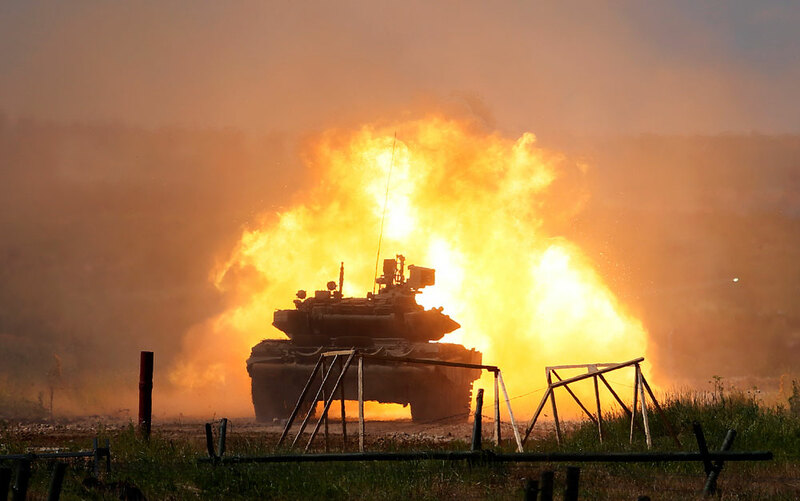 Viktor Murakhovsky, Editor-in-chief of the Arsenal Otechestva magazine, weapons expert and former tank driver discloses what is being fired at tanks in Syria, who is supplying these weapons and what the new Russian tanks' strengths and weaknesses are. A video posted by Syrian militants showing a TOW missile hitting a Russian-made T-90 tank without destroying it has been gaining popularity on the internet. So how are Russian-made tanks on the field in Syria coping with the threat posed by militant groups? Judging by the videos posted online, the impression one gets is that anti-tank guided missiles (ATGMs) are being used against the Syrian government army’s tanks, as well as the militants' tanks. The militants do not have many tanks, but nevertheless they appear on the battlefield. Many of the tanks in operation in Syria are being destroyed in urban battles by regular rocket-propelled grenades (RPGs). The variety of ATGMs and RPGs used in Syria is huge. There are the Soviet-produced Fagot and Konkurs models and the more modern Kornet units that are used by government forces. The American TOW-2As, which have been supplied to the “moderate” opposition, are also given by Turkey and even Qatar to the Islamic groups they control. There are also Chinese and Iranian ATGMs and RPGs, which are used by militants and government forces, as well as by the Kurds. During the civil war, each side seized the weapons of the enemy, including anti-tank artillery. The American TOWs have certainly become the most dangerous counter for Syrian tanks. The modern TOW-2A modification, supplied to many countries, is almost always used. It was a TOW-2A that destroyed a damaged Russian Mi-8 helicopter as it was on the ground rescuing the pilot of the Su-24 plane shot down by the Turkish air force on November 24. The missile can be fired at any target moving at a low lateral speed, including low-flying helicopters and any ground equipment. The result of being hit on the side or in the rear by such a missile is inevitable: No tank in the world can withstand the force of a modern ATGM. How was the Russian T-90 in the video damaged? What is actually seen on the online video of the T-90 being hit? We see a 1992 T-90 tank with a cast tower. Its production year is apparent because it has the Shtora opto-electronic suppression system (projectors visible on both sides of the cannon) and by the shape of the gunner's hatch. The tank is equipped with the Contact-5 dynamic defence system and is covered with composite armour protection with reflecting plates. We see that as the left "jaw" was hit by the TOW-2A missile the dynamic defence was activated and it appears that the main armour was not penetrated. The tank crew was neglectful of responsibilities during battle: The hatches were open and the Shtora system was turned off. As a result of the explosion of the 6 kg warhead, it was natural that the shock wave leaked into the open hatch and the shell-shocked gunner jumped out of the tank. Soviet and Russian tanks were constructed to withstand most anti-tank weapons from any azimuth, more or less 30 degrees from the machine's axis. The tactics of the crew leave much to be desired. Tanks must be used as part of a subdivision and in close interaction with the infantry. A lone tank, especially one that is not moving, is an easy target for a missile. The action took place in the Sheikh-Akil settlement northwest of Aleppo, where the "Mountain Falcons of Zawiya" group, part of the 5th corps of the Free Syrian Army, is fighting. It was a reconnaissance battle conducted by the Hazaras and Afghan Shiites, who tried to occupy Sheikh-Akil but were forced to retreat. The videos taken of the settlement on that day do not show the damaged T-90 tank. There is footage, however, of militants retreating with their equipment, which means that either the tank had left on its own or was abandoned. I believe that the tank maintained its mobility and the crew survived. Perhaps the tank's sights were damaged. In general, it is the 1992 T-90 tanks that are fighting in Syria, but the 2004 T-90A tanks are also present. There will be no breakthrough in the war because of the new technology, such as the T-90 or the Su-35. But the effectiveness of ground combat operations can significantly increase if the tanks are used correctly: in close interaction with the infantry, artillery and aviation, and directed towards the concentration of the main efforts, not alone but en masse.